We are pleased Evergreen made the decision to withdraw their application. 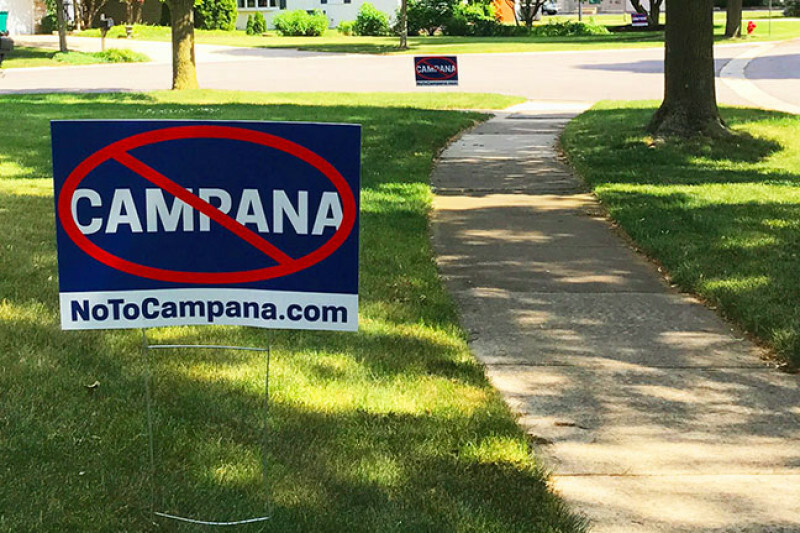 But, there are few families still carrying the burden of the financial costs of what it took to run the NoToCampana campaign. Opposing the Campana redevelopment proposal cost approximately $47,000. The expenses include sign and flyer production, FOIA document production, website hosting, text messaging services, traffic analysis and, the bulk of the cost, legal fees and consultation. The costly legal consultation and work was an integral part of the fight, from the first days to the final petition filed by the adjacent property owner. Without professional legal consultation the efforts would NOT have been successful. While the project was under review, approximately $15,000 was raised from generous folks. We are seeking additional contributions now to assist with the remaining costs. Donations made to this campaign will be used to reimburse the out of pocket expenses for legal consulatation and representation. The funds collected from this campaign will go directly to the individuals in the neighborhood that already made these out of pocket expenditures. If you have already contributed we THANK YOU and just ask to spread the word to family, friends and neighbors who also opposed the redevelopment.